Cost of maintaining addiction to increase. Posted in Busy Lady Stuff, Trite | Comments Off on D’oh! 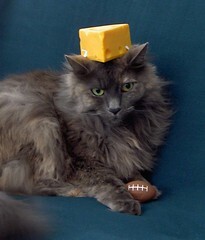 I posted previously about successfully submitting this picture of Minnie to StuffOnMyCat.com. She appeared on that website in March. 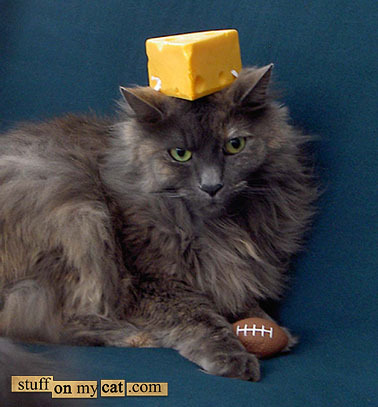 Today, in need of some frivolity therapy after spending far too much time and energy giving¬†public presentations on various legal topics, I was happy to visit that site and to find a new posting of¬†another Cheesehead cat (named Big Kitty) there! Not only have I learned that another cat owner and packer fan likes to put “stuff” on his or her cat,¬†an¬†observant commenter on that site¬†referenced, and directed viewers to, the picture¬†my very own Minnie! So let’s here it for cats! And for Big Kitty! What’s the deal with Slinkman (the Banana Slug)? I find this disturbing, somehow, as that is my maiden name, and a name that I know others often have a hard time pronouncing.¬† I can’t figure out if the show’s creators named a slug “Slinkman” because it seems like a natural description for a slug (who slinks along), or if – as I’m guessing is more likely – Slinkman was named after someone’s buddy. But I do find it odd. You don’t even want me to say what I thought when I¬†saw that link title on MSN.com¬†today. . .
And then it turns out to be about a guy whose last name is JOHNSON??!! How have I managed¬†not to hear until now about this unfortunate name/nickname pairing? If civilization hangs in the balance ‘twixt¬†cup and lip, please,¬†gentle women and men,¬†refrain from discussing¬†this man’s¬†coarse moniker over tea. 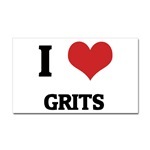 Grits.¬† You either love em’ or hate em’. I got caught lovin’ ’em at work today.¬† By someone who hates ’em. I guess she has carotenemia. We’ve “discovered the power of carrots,” all right. This all came to our attention last Friday. Since then, every meal that she eats on our watch (I don’t always know what she eats at daycare) is based on green vegetables. So she should return to her normal, delicate hue soon enough. We’re just going to have to help her love those sweet potatoes a little less… (They, like squash and a majority [argh!] of blended baby food flavors, also contain loads of beta-carotene, the orange-tinting culprit). QUIZ – What Type Of Cheese Are You!? You are currently browsing the archives for the Trite category.